Please note, Dandelyan is now closed. Lyaness bar will open soon at the same location and from the same bar team. Time Out Editors, March 2019. 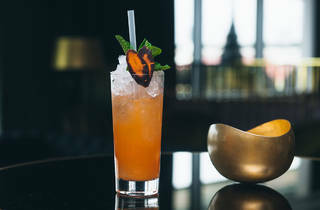 Ryan Chetiyawardana, aka bartender Mr Lyan, is a London cocktail dignitary – he's worked in some of the city’s most pioneering bars and now has his own range of mixed spirits in Selfridges. He opened his first bar in Hoxton in 2013, and hot on its heels is this second one. Number two couldn’t be more different. 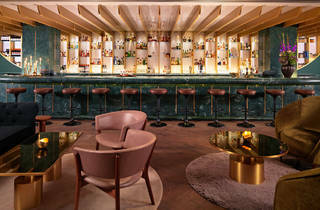 Dandelyan has a prime spot off the lobby of the new multimillion-pound Mondrian hotel in the former Sea Containers House. 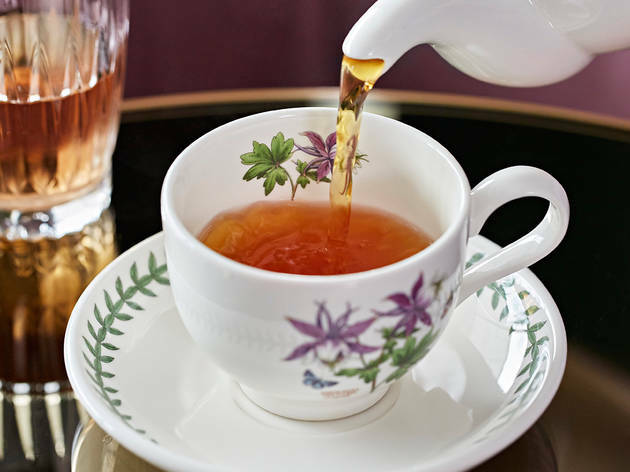 Dandelyan is run by a team of super-slick international-hotel ‘servers’. 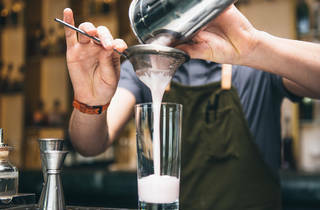 White Lyan set out to shake up the cocktail scene by dispensing with ice and all perishables, and Dandelyan’s menu is just as groundbreaking – ingredients include 'chalk bitters', 'crystal peach nectar’ and the archaic-sounding 'dandelion capillaire'. 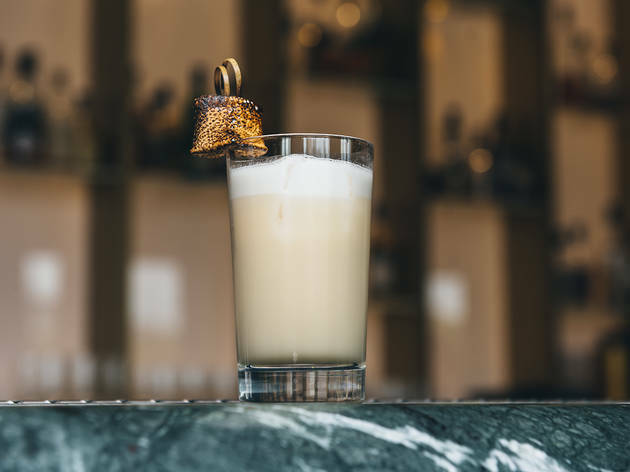 The bar might be glamorous, luxurious and even a bit formal, but the drinks show Chetiyawardana’s invention and attention to detail. 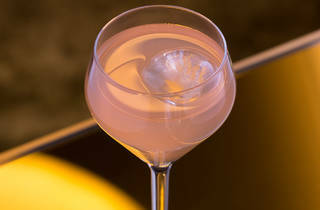 Ford & Warner (£12.50) was a fruitily fearsome blend of gin, 'bittered blackcurrant', dandelion flower and lemon, garnished with a little frozen cube of blackcurrant sorbet. An Evil Manhattan (£12.50) didn’t live up to its name but did contain a house-made beer 'vermouth', rye whiskey and bitters. Everything here has a hint of the garden about it, and everything is surprising without being show-off, and most of all, inherently drinkable. Dress up before you drink up; it’s that sort of place. 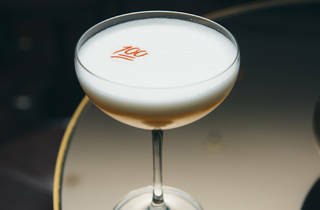 Rated the second best cocktail bar in the world in 2017, I am sure Dandelyan is on a lot of drink aficionados to-do list. So is it worth the hype? Unfortunately for me, not really.Unlike the American Bra (rated No.1 in the same year), Dandelyan has a very hotel-bar kind of feel. The staff are extremely friendly, knowledgeable and attentive, however the cocktails are fairly mediocre. I definitely think it is worth checking off the list, but I wouldn't be tripping over to get in. Dandelyan – a not-so-hidden drinking gem in the Southbank! Definitely a place to book and dress up, everything about Dandelyan – from the Dixon decor, to the gorgeous menus – says luxury. And once you're in, it's easy to forget you're in a hotel! 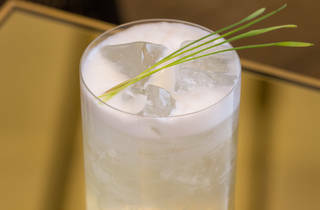 Dandelyan's current menu is entirely plant-based, and each cocktail comes with it's own story. 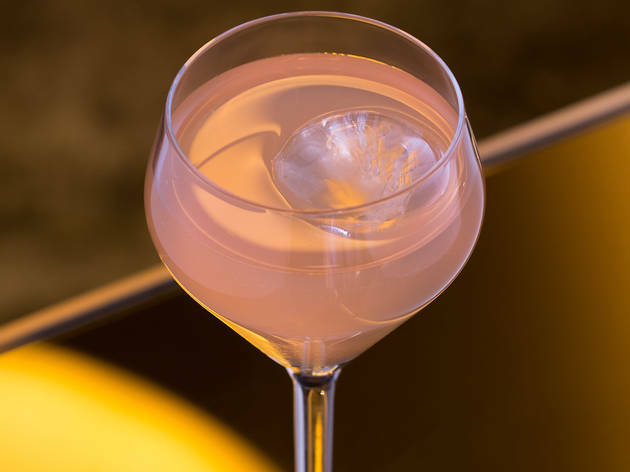 Between 4 of us, we made our way through the list, with our unanimous favourite being the Canon Cosmo – so well balanced, just the right amount of sweet, and delicious! In true Lyan group spirit however, all of them were really clever and inventive. 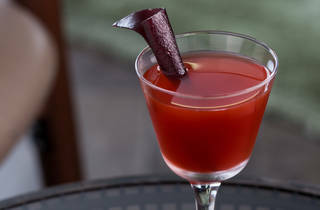 A tequila concoction came served with chargrilled blue corn, which gave off a really great smokey scent as you drank. The lobster oil fries and goats cheese focaccia from Borough Market were also great accompaniments. Great cocktails but with a very expensive price tag. The 2 cocktails I had here were both delicious, but at around £14 each I don't know that they were worth the money. You can get similar cocktails in London for around £10, which is a bit more reasonable I think. That being said, the setting is lovely and the service is good, so for a special occasion it's a nice spot to have 1 or 2. As you'd expect of a swanky London bar, drinks aren't cheap, but they're not extortionate either and are well worth the experience - not to mention the gorgeous water side setting. I've visited many times without booking, but it can get busy at the usual peak times so if you're going with a big group do make a reservation as this is one place you don't want to miss out on trying. This is a beautiful bar in a stunning location. Right on the south bank, overlooking (in my opinion) one of the best views in London. 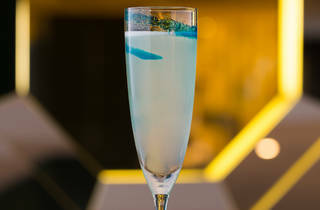 The decor is tasteful yet quirky and the cocktail list is extensive enough to please even the pickiest drinker. Booking a table in advance is probably a good idea but the staff are more than accommodating and service is efficient despite the bar being fairly sizeable. LOVED this bar... We had a little table booked for drinks at Dandelyan and so glad we thought to call ahead! All the tables are reserved although there was space at the bar for the less organised! We had several rounds of cocktails which were simply delightful - I also tried orange rose which was amazing! Worth a visit as the staff are incredible too! Sooooo... I came here this evening as I'd heard it recently won an award? OK so I will say that it reminds me of a very nice hotel bar.. To be fair it is haha but I expected it to stand out separately from the hotel.. It didn't.. It didn't feel intimate or cosy. The cocktails start around £12-£13.50... Standard London cocktail prices at places which don't involve dungeons and seedy bars. The service was good but I felt like I was asked if I was enjoying my drinking 1 too many times.. Also before I got to finish eating my edible chocolate stones from my drink the bartender swiped it from the table.... They need to work on that. Also I don't think my friend's drink were complex or visually pretty enough for the price. Would I go back? Probably not. I think the buzz here is the view of the Thames.. Not the drinks. I've been here twice and I do enjoy the décor, first and foremost. It really lends itself to a great vibe for a hotel bar. The greens and pinks pop with the metallic accents. Now about the drinks... delicious for the most part, and pricey. Yes, they're innovative and you won't find them anywhere else in this great city, but is that enough to believe the hype? I'm not so sure. 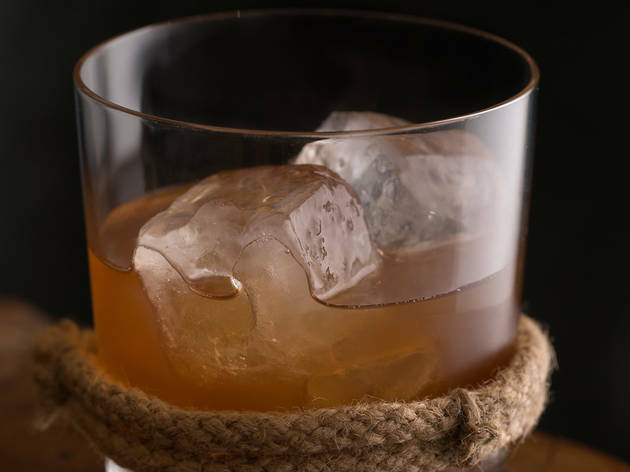 I do recommend taking a peek and perusing the menu for something to your taste - though I'm sure that one of the bartenders could easily figure something to mix for you. Nestled next to the Thames on the South Bank I was glad I reserved a table as soon many people were turned away, whilst we sat slipping cocktail and enjoy the bar food which was also as exceptional as the cocktails were, and they didn't bat an eye going off menu to finish on a couple of dry martinis, recommended but remember to book!! Loved this bar, it was the perfect mix of chic, ambience and decadence. The drinks menu was carefully curated - as were each of the cocktails, and despite the price tags I think it was worth it. Service was impeccable and we got regular top ups of water which often goes overlooked. The views were amazing, and the staff were also really helpful when deciding on drink choices. Will definitely go back, and think it's perfect spot for a small group gathering or date night! Beautifully decorated bar with equally beautiful cocktails set within the Sea Containers. 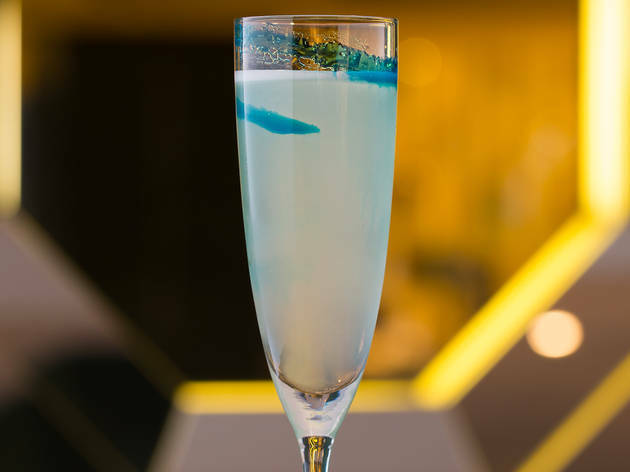 Each drink is part of a story and have been curated with innovative and obscure ingredients yet taste delicious. The staff are efficient and helpful when asking for advice on drink choices and it's a great place to take a date or friends alike in its cosy yet stylish surroundings. 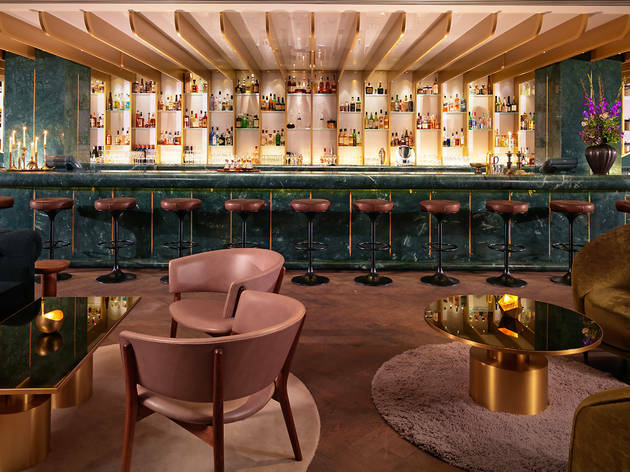 A beautiful bar within the stunning Sea Containers Mondrian hotel in a prime location on the South Bank. The view is spectacular and the décor is wonderful. Even the menu is beautifully presented. Cocktails are the star here, using all kinds of weird and wonderful ingredients from crystal peach nectar to chalk bitters. All that we tasted are deliciously unique, some are even topped with a little cube of flavoured sorbet instead of ice. 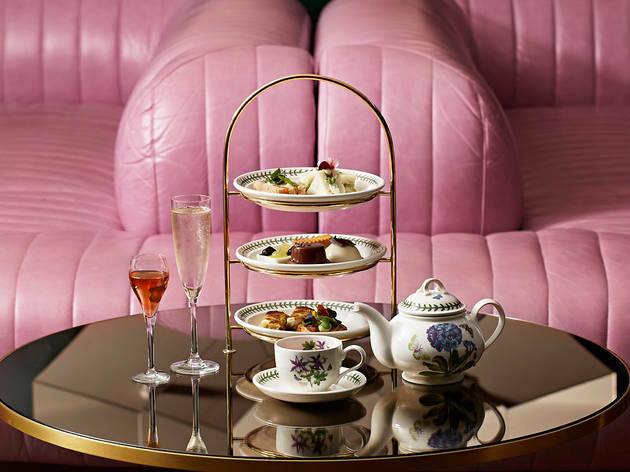 The Wyld Tea is amazing – an Afternoon Tea with a difference, from the tasty food to the expertly paired cocktails. The servers are incredibly knowledgeable too and seem to take great pleasure in explaining the extensive menu in great detail. A fantastic place with a price tag to match. Definitely one for a special occasion! A bit too busy and noisy if you are looking for a quite drink. I didn't feel like the price reflected the quality of the drinks at all and was slightly disappointed with the overall experience. The staff were very friendly though and service is relatively quick. Make sure to book a table on the weekends. We went for the Wyld tea on Saturday and the menu is truly amazing, cocktails were beautifully matched to the food. A very different afternoon tea experience with views over the river. However, it was let down by the service. The man who met us at the front to confirm our booking took us to a table on the edge of 2 corner sofas where we were to be 'perched uncomfortably, for our tea experience. I asked politely if we could move to a corner seat which had been set up for 2 to be told abruptly 'No', 'no it isn't specifically reserved' but no we couldn't move. A couple of ladies arrived at that table and sat after us. Shocked at his reaction to my request, I asked our waitress, Georgia, whether a small table could be fitted into the corner by the window to mirror the set up on the other side, explaining the previous experience with the man. She said this was not possible as the table doesn't fit. Half an hour later, 2 ladies were seated at a table which miraculously was fitted into the space I had requested! Georgia was very pleasant for the rest of the service. However the man whose name I was not allowed to take, served us one cocktail which he placed on our table and stated the ingredients. This same cocktail he served to the tables around us and he managed to crouch down so he was eye level with them to explain how the ingredients interacted with each other and the best way to enjoy the cocktail. I'm not sure what made us different to the other customers, but clearly the customer service was not uniform and really let down a beautiful experience in every other way. 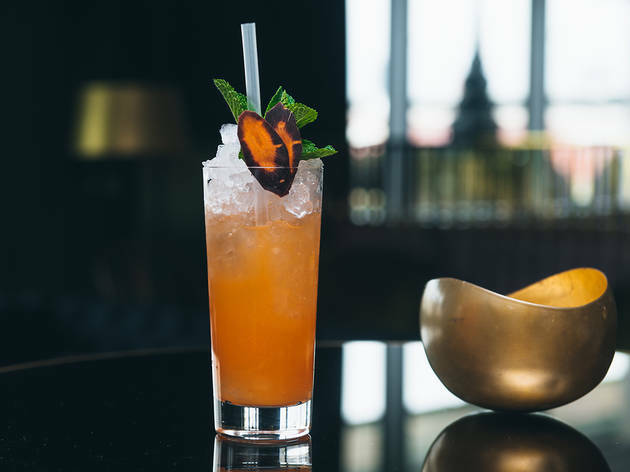 Delicious cocktails with incredible views across London. The perfect spot for a date, drinks with colleagues, a girly catch up, a family reunion....well pretty much anything, as long as you don't splashing a little cash. I would advise against going and just getting a g'n't, you will be missing out on some delicious and interesting alternatives. 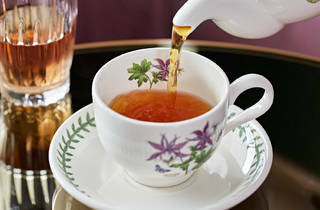 The staff know their stuff and are always happy to recommend a drink you may like based on your preferences. Oh and their Mac and cheese is to die for. Get one each, you will regret it if you share! I've walked past this building about a hundred zillion times and would never have gone in if it hadn't been for my date for the evening. What a good choice! It is super swanky and you want to be wearing something smart/casual for sure. It's an air conditioned dream with a view out over the River Thames and one of the best cocktail menus I've ever seen! The waitress spent time chatting about what we liked, so it made ordering super simple and the cocktails were delicious. One to try for a special occasion as prices are on the high side. 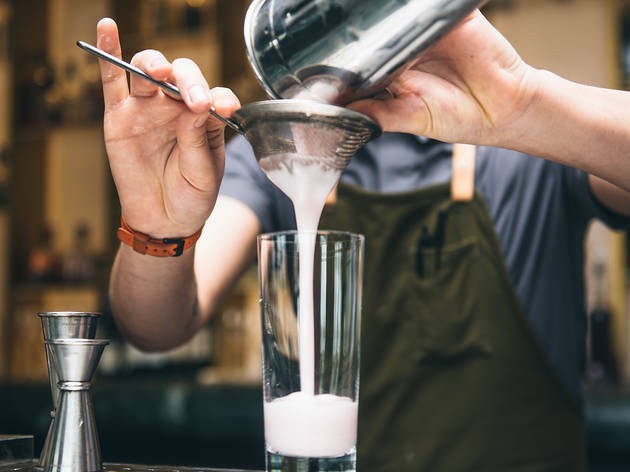 You don't rise to the top of the mixology ranks for nothing, so it almost feels nonsensical to praise Mr Lyan (Ryan Chetiyawardana in real life. I google it every time I review his venues!) for doing well what he is known for doing best. All the cocktails we’ve sampled were spot on (and in between me and various friends over a few visits we sampled quite a few!). So I’m gonna focus on other things here. Like, how Dandelyan is a place for all times and all seasons. I normally come in late, but this time round we arrived early after a stroll by the river. The transition from Dandelyan as a destination for afternoon apperitives with a view (the full length windows allow for some great vistas and plenty of natural light) to a busy Thursday night hotspot is mesmerising and I loved it. You can literally see how the vibe changes. Dignified and well-off middle-aged couples on a tour of the capital and suits give way to the sleeker younger crowd. 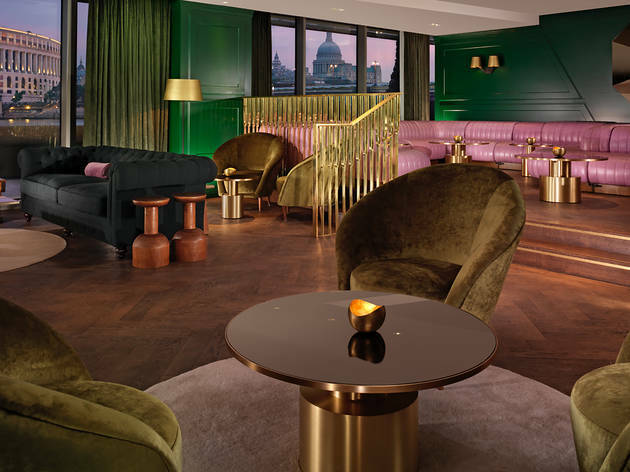 The green marble bar top and low jewel-coloured banquettes, beautiful in themselves, become ripe for some quality people watching! Yet Dandelyan is neither worse or better for this change - different, definitely, but still perfect. I do wish Dandelyan was open for breakfast. I’m sure they’ll be able to pull it off beautifully too. This time, and for the first time ever, we opted for wine after a couple of initial apperitives (like everyone else we usually stick to cocktails) and were happy with our Sauv Blanc selection. We also sampled pretty much all of their bar snacks. Inventive and plentiful. Finally, the service was spot on as always: the shift of our waitress was over at some point, and we didn’t mind, didn’t notice - the transition was seamless! Great hotel, lovey drinks - very tasty and strong. Also lots of great contemporary art pieces in the lobby, as well as having a very cool little cinema in the basement! Dandelyan is gorgeous. Gorgeous, gorgeous, gorgeous. 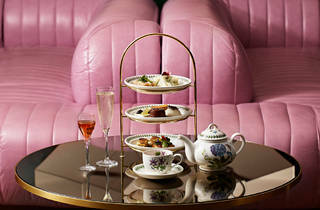 The decor is stunning, the staff are knowledgeable and sweet without being over the top and the drinks are to die for. Mark my words, you will be merry after one. You will be drunk after two. After three, I can't tell you because I can't remember. These bad boys are strong, delicious and cool as hell. 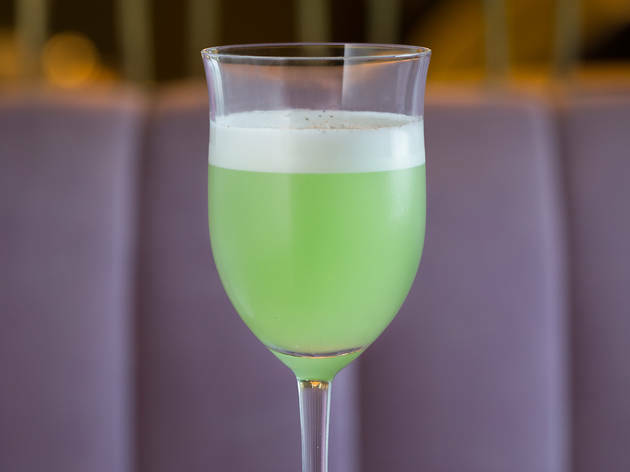 You'll be sipping on grass syrup, plant haemoglobin and other odd-sounding treats you'd never expect to be drinkable or tasty - but they are. A perfect spot for a fancy drink, and it's worth the £12.50-£13.50 price tag per drink. Dandelyan is by far one of my favourite cocktail bars, whether for a pre-dinner date or an evening with the girls. 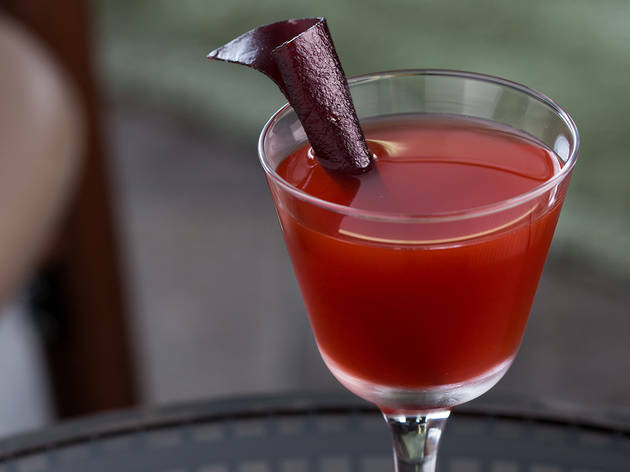 The cocktail list is influenced by modern botany and changes seasonally; currently the theme is hunter and gatherer. 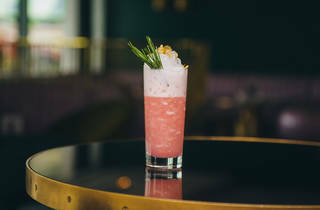 On my latest visit I had the most stunning cocktail (photographed), Fairchild's Mule: Hendrick’s Gin, lime, pink clove, green cardamom, ginger and Perrier-Jouët Champagne. The pork buns from the bar menu -albeit expensive- are among the best bao to be found in London, made with crispy pork belly and pistachio crumbs. The door and waiting staff are all extremely friendly and hospitable, remembering my last visits and genuinely seemingly interested in providing a pleasant drinking experience. 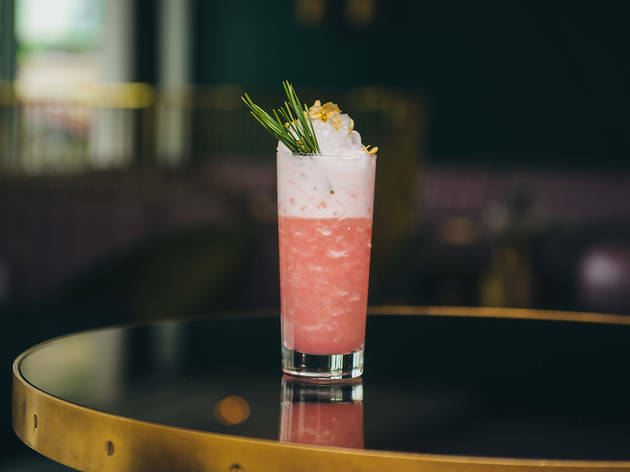 Follow this up with a visit to the Curzon Mondrian downstairs in the basement of Sea Containers House, and you have yourself a perfect night or lazy weekend afternoon. 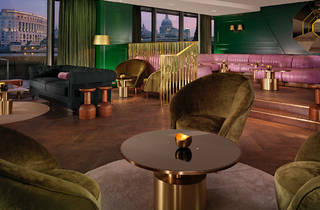 This is great and lovely class bar in the Mondrian Hotel set in the beautiful surroundings of South bank by the river Thames. 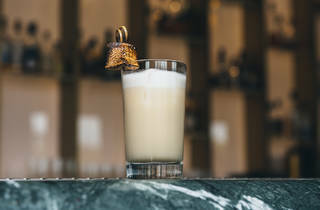 Whether you go with a group of friends or for a romantic date, this bar is amazing and offers great classic cocktails in a cosy trendy atmosphere. Love the branding of the bar with the coaster beautifully decorated with flowers and the presentation of the drinks menu (very original and artistic). A great spot for drinks to keep on your London's must place to go list! This is a lovely classy bar on the river. The door staff are very friendly and the drinks are amazing. The old fashioned is possibly the best one I have ever tried! There are some cocktails that I did not like that much- Dynasty for example I thought was completely overpowered by the saffron, however this cocktail has won awards so I might not have such a sophisticated pallet for it. The concrete sazerac on the other hand was great! With chocolate rocks at the bottom which were delicious to eat! The waitresses were very friendly and always helpful. Amazing drinks and a great view to match. Excellent for people-watching. Gorgeous hotel with an incredible bar, cinema and restaurant located right by the river in Waterloo. 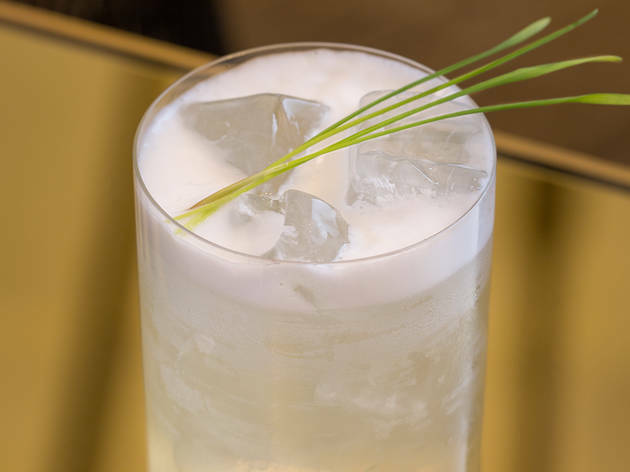 Have an earthy mocktail with egg white and celery before you mosey on down along the river bank to catch the sunset and visit the summer markets. I enjoyed my time at Dandelyan. I really did. However... Best Cocktail Bar for 2017? I feel thats a very tall order which is very dependant on the person and the criteria. 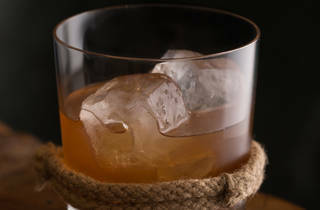 Sure the cocktails are innovative but so is Nightjar. Sure the ambiance is pretty cool but so is Evans & Peel. Weird ingredients? Check but Peg + Patriot can also boast that claim. 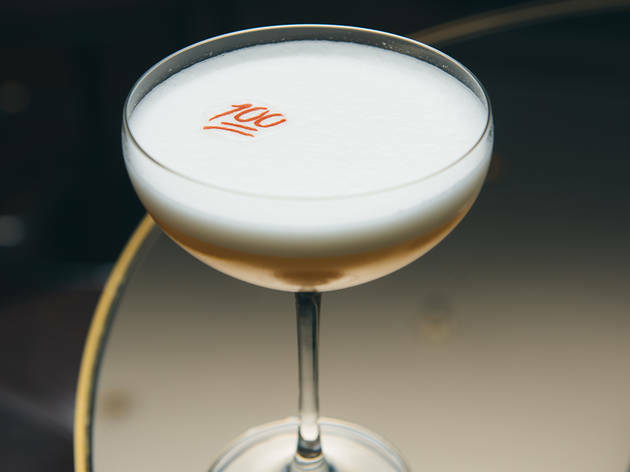 Pricey cocktails? My friend... EVERY cocktail bar in London can fit that bill. This all being said... I really recommend you go. I enjoyed my drinks and again the ambiance is cool albeit a bit too 'open' for my taste (at the end of the day, its a cocktail bar in a hotel). The bathrooms wee pretty cool though and the architecture inside is very interesting. Great way to end a special evening. 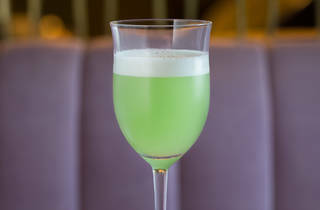 I went to Dandelyan for my birthday and I was super excited to go to the bar voted "Worlds Best Cocktail Bar 2017". The bar in itself is very impressive! The decor is chic, the cocktails are delicious and the staff were attentive and helpful, especially when choosing cocktails. Unfortunately, on the night I was there, they seemed to have a problem with fruit flies. They were hovering over our drinks and even made their way into our drinks. I had to move seats within the bar a few times to get away from the flies but this didn't work, they were everywhere. Unfortunately, because of this, Dandelyan did not live up to its reputation for me.